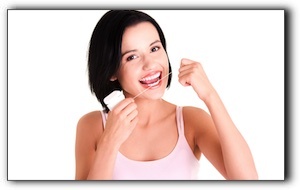 You may think the most important thing about flossing is simply to do it every day. At Decatur Smiles, we agree. But many people find that trying out different types of floss helps them to establish or solidify the habit and get the flossing comfort they desire. With that in mind, let’s consider some of the most common types of dental floss. Basic floss is either a monofilament floss, which is ordinarily made of some kind of rubber or plastic, or multifilament, which is made of nylon or silk. Nylon floss is less pricey, more common and is sold waxed or unwaxed. Monofilament floss will not rip or tear, and because of this, many people find that it pulls in between the teeth easier. This type of floss is usually referred to as “glide” floss. Dental tape is nylon floss in the shape of a wide, flat ribbon. Many people find that dental tape is the easiest floss to get between their teeth. For those of you with braces or appliances, there are also flosses designed to be used with these devices. Make sure to communicate with your orthodontist about flossing because you don’t want to break this essential habit just because you’re having your teeth aligned! A good person to give you guidance about flossing is one of our dental hygienist. They’re happy to answer any questions you have about flossing and brushing habits. At Decatur Smiles in Decatur AL, your dental health is always our top priority. Our services include general and cosmetic dentistry. Schedule your next cleaning and checkup with us today, and don’t forget to floss!